Almost everyone on my social media feeds are either enjoying the cold weather somewhere or getting their tan on at the beach. While I would definitely enjoy wallowing in either an ocean view or single digit weather, I am at home. If you knew me well enough, that's not a bad thing at all. I love staying at home, either vegging in my room or whipping something up in the kitchen. I do enjoy the occasional night out with friends, "occasional" being the operative word here. So yes, I am enjoying this travel-less vacation quite a bit. This also gives me the time to finally catch up on recipe/blog posts. So while I am enjoying being in my pajamas (Yes, at 1pm I am still in my pajamas) and in my air conditioned room, I am able to catch up on sharing recipes that have been collection cobwebs because I have managed to make my life crazier in the past few months. Still, I am very, VERY grateful! 4 months ago I was able to open a business called Manila Belly (Manila-style porchetta! Please check it out if you have the time!) on top of that, I still work full-time. I am also cooking up something together with Michelle Aventajado of www.mommanmanila.com who also happens to be my partner for Mothers Who Brunch. Please watch out for that!!! Anyway, I was able to try banana bread granola a few months back from this local market seller and I instantly fell in love! Sadly, they discontinued the flavor so I had to get creative. Granola is such an easy thing to make, I've been making quite a bit of it lately like the Matcha Granola recipe I posted a few months back. However, I just knew that I had to recreate it so I could always have a stash waiting for me. 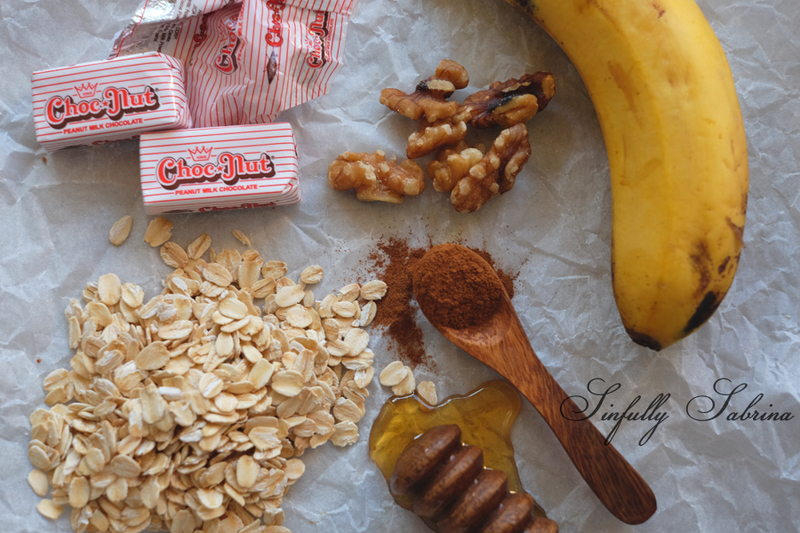 You have the option for this granola recipe to be completely vegan but I just had to add something "sinful" to it. That ingredient would be chocnut. It's crumbly, nutty and chocolate-y. Everything that goes well with banana. Plus chocnut is such a nostalgic Filipino treat that it will definitely be a welcome layer of flavor. 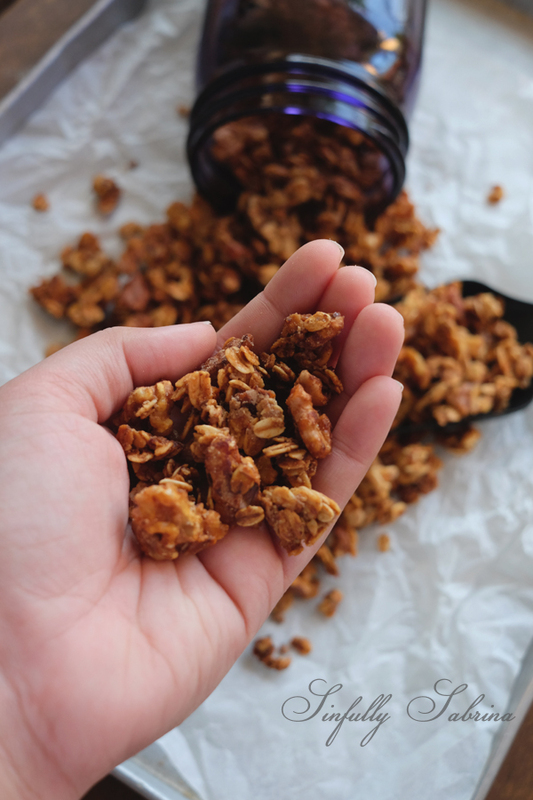 This Banana Chocnut Granola recipe is a great idea for party favors. I hosted a gathering before and it was such a hit! My guests were happily posting photos days after showing me how they had it: with milk, yogurt or just straight up with a spoon (that's how I would do it too!). Just place them in cute jars and tie around a personalized tag with jute string. It will go perfectly for any theme you might have and homemade is always a nice touch. Mix oats, cinnamon, sugar, salt, flax seed meal, nuts, banana puree, melted coconut oil, honey and vanilla extract together in a large bowl until well combined. Spread the mixture evenly onto one or two baking sheets and bake for 30-35 minutes or until golden brown and crunchy. Remove granola from oven, add the crumbled chocnut and toss a bit to let the heat escape. Cool completely and store in a container or jar. Serve with milk, yogurt and fresh fruit. Recipe adapted from The Minimalist Baker.